One of the most spectacular and feminine styles that exist as trends in the world of fashion is the boho or bohemian one, which forms an important part of the fashion lines of many brands. Traditionally, bohemian style includes lots of nonconformist attitudes. The term itself originated in late 18th and early 19th century France and was used to describe someone who chooses to live outside the mainstream. A “bohemian” came to refer to a poor artist who lived a nomadic lifestyle and rejected many of the trappings of traditional society. Beyond clothing, bohemianism also involves anti-establishment action; critical thinking; individualism; and above all, an interest in art, whether it be music, visual arts, or literature. 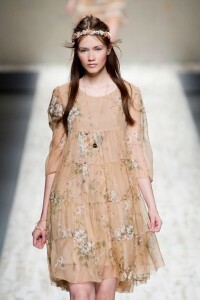 Bohemian style consists of loose, colorful clothing and has been known as boho chic, hippie style, and Aesthetic dress. With their long flowing hair and rich, though threadbare fabrics, bohemians stand out in a crowd representing a colorful counterculture based on creativity, poverty, and an indifference to social structures and traditions. Comfort in everything, especially the shoes, which are traditionally made with not too high heels, on platform or wedges. The lavish amount of accessories. The latter may include bracelets, sunglasses, necklaces, belts, earrings, pearls or jewels, bands, headbands etc. Natural tones and colors. This immediately implies the absence of neon shades. The existence of floral patterns, checks, ethnic inspired prints, eclectic hints and avant-garde style accents. High waisted designs, flare finishes, fringes, big accessories, lace, maxi skirts, variously textured pieces, knitted details, etc. Basically unchanged for many years, bohemian style came to be associated with young people hoping to distance themselves from the materialistic culture of past generations. Bohemian style gave birth to more modern counter culture styles. But as mass media embraced bohemianism, one wonders if the term is still viable. When a counter culture goes mainstream, the style can no longer be viewed as alternative.